What flavors do you have?” the husband asks. Wendy Weinberg, baker and co-owner of Barrington Bites, smiles and looks up. She puts down the canvas pastry bag with which she has been swirling ribbed, peaked vanilla chai buttercream spirals onto tiny vanilla chai cupcakes, and turns to the fit and tanned couple in their 70s who are studying the cupcakes along the front counter . We are in Weinberg’s four-month-old mini-cupcake bakery in the demo kitchen at The Chef Shop on Railroad Street. She wears a pink apron, on which cupcakes of every color cover her from neck to knee. Matching pink oven mitts hang on the cabinet behind her . Weinberg has been here since 8 a.m. preparing the day’s batters and frostings — all from scratch. All use old-fashioned butter and eggs, sugar and flour — except the flourless chocolate soufflé and the gluten-free ginger spice — pure extracts, spices, chocolate, cream cheese, nuts and fruits. By the time the shop and the bakery open at 10 a.m., at least three or four flavors of cupcake are baked, frosted and ready to sell under clear domes on pedestal stands. Weinberg continues to bake and frost until late afternoon. Closing is at 6 p.m. on that Thursday. Everything is made fresh every day. Leftovers get given away. Weinberg names the day’s cupcakes. There are nine — 10 if toasted pecans are added to the frosting of the carrot cake. “Vanilla,” the husband says decisively as soon as Weinberg has finished her list. “After all that?” his wife asks. “I like to start with the pure, the simplest,” he says loftily, still eyeing the rest of the cupcakes. His wife asks for a White and Black, and, with gloved hands, Weinberg gives them their cakes on little napkins. The man pops his into his mouth. It’s gone, unceremoniously, both cupcake and rosette topping of Madagascar Bourbon vanilla buttercream sprinkled with glassy little varicolored sugar crystals. He wipes his fingers, drops his cupcake paper and napkin into the shiny Waste can and walks on into the kitchenware displays. His wife has not yet taken a bite. She walks away, slowly peeling the paper around her mini vanilla cake topped with a rosette of chocolate buttercream. Weinberg returns to the stove, measuring batter into cupcake papers. Not everyone wants vanilla or chocolate only. Weinberg herself likes bold flavors. She said lawyer told her he was addicted to Good Humor Toasted Almond bars from his childhood. Barrington Bites also makes a banana cupcake and a dark chocolate cupcake frosted with Nutella hazelnut buttercream. They make an eggnog cupcake frosted with spiced (real) rum buttercream and one called ‘French Toast,’ a cinnamon-nutmeg cupcake frosted with real maple syrup buttercream sprinkled with brown sugar bacon. 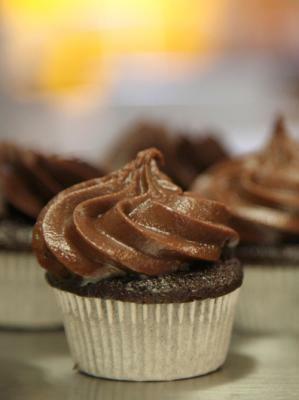 They do a devil’s food cupcake with caramel buttercream sprinkled with fleur de sel (sea salt crystals). Two women ask about the flavors, get the lineup and both go off with the day’s special, Coconut Patty. A woman in her thirties comes to the counter and asks Weinberg for a dozen cupcakes for that evening. Weinberg thinks cupcakes are a great way to offer dessert at a dinner party. “Not everybody likes blueberry pie. Not everybody likes chocolate cake. Give your guests a choice,” she suggests. Two women and a small boy order cupcakes and wander off, peeling off the papers. The seed for Barrington Bites was planted when Weinberg’s bakery partner, Sherri Gorelick, and her then-nine-turning-ten-year-old daughter Ava Mikkelsen were on vacation in San Fran-cisco last summer. They said they ate their way through cupcake stores there. When Gorelick returned she called Weinberg and the two agreed that the Berkshires needed a cupcake shop. Rob Navarino, Chef Shop owner for over 15 years, is Gorelick’s boyfriend. While the women do pay rent, installing their cupcake concession in the rarely used demo kitchen was a natural. Over the next eight months of planning and testing, the women enlisted Chef Shop customers’ help in tasting and rating their developing cupcakes. Cupcakes and cupcake bakeries may have besotted cities like New York, Los Angeles and San Francisco for over a decade, but Barrington Bites is the first dedicated cupcake bakery in the Berkshires. The women have ideas beyond cupcakes. “We will be working on savory come fall,” Weinberg said. That may mean savory cupcakes, mini-pastries, savory mini-soufflés. What else? “We’re four months old and we’ve been welcomed into the community. Other things [than cupcakes] aren’t even in the planning stage. We’re just in the talking stage,” she said. Still, a few weeks ago, the bakery’s special of the week was not a cupcake. It was chocolate, vanilla or strawberry mini Rice Krispie Treats in the tiny cupcake papers. And the treats were frosted: With marshmallow or strawberry marshmallow or chocolate or peanut butter buttercream. Weinberg called it “a cross between a Krispie Treat and a cupcake.” There were no leftovers. Weinberg and Gorelick came up with other playful recent weekly cupcake specials: Pink Lemonade (a lemon cupcake frosted with pink lemonade buttercream); Key Lime Pie (a lime cupcake with Key lime buttercream and Graham cracker crumb topping); and German Chocolate Cake with a boiled brown sugar frosting, pecans and coconut. The German Chocolate is what Weinberg calls “a keeper”. It will become a regular Barrington Bites flavor. Weinberg has had previous careers in human resources and corporate sales. Gorelick still works in corporate sales. While Gorelick is more behind the scenes, both women say they are very happy with their new baking life. In addition to selling at the bakery itself, they have catered garden parties and birthday parties, graduations, bridal showers and events at Chester-wood and the Norman Rockwell Museum. Artist Jenn Marcel, Weinberg’s assistant baker, enters the kitchen at this point in the afternoon. She puts on an apron, whips up some more buttercream and begins to frost more intense chocolate cupcakes with thick, jaunty caps of coconut buttercream. Marcel bakes and runs the shop on Mondays. A mother, father, grown daughter and younger daughter ponder the cupcake stands. This entry was posted in About Cupcakes, cooking, Cupcakes, Cupcakes in the News, dessert, Food, Gourmet, Kosher, Recipe and tagged Baking, Cupcake, Dessert, Food, Gourmet, Kosher, Recipe. Bookmark the permalink.